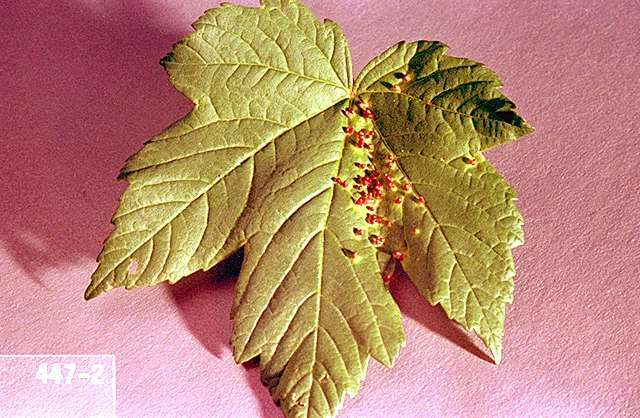 Description, biology and damage The maple bladdergall mite is a tiny eriophyid mite that feeds on the underside of leaves. Infested leaves initially develop small depressions which soon grow into brilliant red bladder-like galls 0.125 to 0.25 inch in length. Later in the season, the galls may turn green or black. 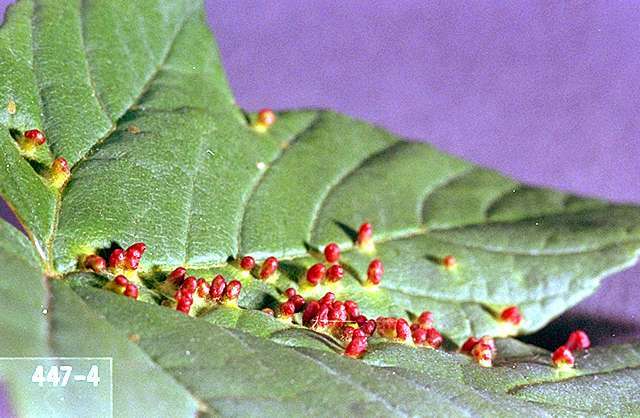 Silver and red maples are particularly susceptible to bladdergall mites. Severe infestations may cause leaves to become distorted. Although an aesthetic concern, bladdergalls are seldom harmful to the trees. Occasionally trees may be defoliated (trees drop their leaves to rid themselves of mites); this is an effective "strategy" of the plant to rid itself of these parasites. Trees often recover without galls in the next year. Biology and life history The mites overwinter in cracks and under bark scale and begin feeding in spring after leaves emerge. Mite activity typically stops by around July. Hand pick severely infested or distorted leaves to improve appearance of small trees if needed. A few galls will not impact the overall health of the tree.